Ener1 are the first automotive lithium-ion battery company with its primary manufacturing plant based in the U.S and are poised to produce the first li-ion electric car battery for mass production. Their li-ion battery unit, called EnerDel is currently preparing to produce the li-ion pack for Think Global for the Think City electric vehicle to be sold in Europe. 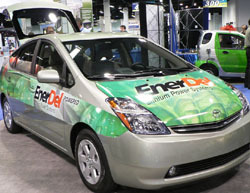 This will be the first large-scale installation of li-ion batteries into a consumer electric car. Currently only the Tesla Roadster, in initial production, and GM's Chevrolet Volt due for release in 2010 are the only electric vehicles to use li-ion battery technology. All other hybrids currently on the market use nickel metal hydride batteries. Ener1 are also chasing two major deals to develop li-ion battery packs for major auto manufacturers. The hope is that with large-scale production the price of battery packs will come down dramatically. Their CEO, Charles Gassenheimer, has indicated that battery costs could come down by as much as 50% in coming years but for this to happen the production of li-ion batteries would need to be in the hundreds of thousands. Demand in European markets is already strong, but it seems the U.S market has some catching up to do. If battery prices do drop by this much, with oil prices remaining at roughly US $100 a barrel, then the payback/ break-even period for hybrids will drop from about 7-8 years (currently) down to 2 making them a much more appealing prospect to car buyers. The hotting up of the race to bring li-ion storage solutions has been further fueled by Toyota's announcement to bring forward from 2010 to 2009, the production of a plug-in Prius hybrid with li-ion batteries.